Fine Italian Coffees and a selection of sweets; all of the essentials for after-dinner coffee service or Sunday brunch! Contains all the essentials for after dinner coffee service or sunday brunch. 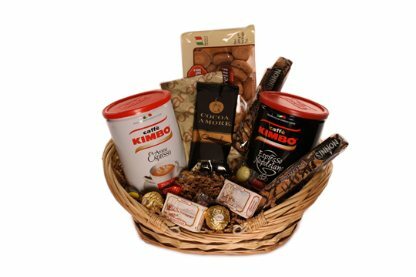 Includes imported italian coffee Espresso Napoletano by Kimbo Coffee, Aroma Espresso by Kimbo Coffee, 2 Gourmet Biscotti, gourmet coffee single packet, Cocoa Amore hot cocoa mix, Imported Amoretti Cookies, Imported Italian Torrone and Ferrero Rocher Chocolate.